Leading the Suicide Squad can be a pretty thankless and dangerous job, but luckily, Floyd Lawton is usually up to the task. Then again, it’s not like he's got much choice in the matter. Still, despite it all, Deadshot is the sort of guy who always seems to find a way to (literally) keep his head on his shoulders, even when he's working with the infamously ruthless Amanda Waller and Task Force X. But all of that might be about to change. In the new DC animated movie Suicide Squad: Hell to Pay, Waller's secrets have come to collect and Deadshot has found himself caught in the middle of a gambit that could either cost him his life or get him out from under Waller's thumb for good. To get an understanding at just what might be going through Deadshot's head at such a critical moment, we sat down to talk to the man himself: Christian Slater, who voices Deadshot in the film. Hell to Pay is actually your return to voicing Deadshot after you did some work with him on Justice League Action, correct? Can you tell us how you came to the animated DC Universe to begin with? What's your origin story? I was very excited. It was great to have the opportunity to work on that project, I really enjoyed it. I actually felt a natural affinity for the character, so it was great to be called back for another chance to be part of a larger animated feature with him. Especially an R-rated movie. I thought, "Oh, wow, that's even more exciting." I was really happy to be able to be a part of it. This is a very R-rated movie, particularly compared to the family friendly Justice League Action. Do you approach the character differently for those different demographics? Was there anything different about this process? You know, in a certain respect, Deadshot is just Deadshot, whether he's in a "G" situation or an "R" situation [laughs]. But no, in this one we certainly got to see a lot more of the shocking stuff. Even as I was watching it, I gasped a few times at a lot of the decisions [the animators] made. I was totally surprised. A lot of the directions some of the scenes went, I was like "Whoa! Okay!" It gets pretty intense and it's not very subtle. But really, I was thrilled. I think it's important to set the Suicide Squad apart and put them in their own universe, as opposed to the [more family friendly] world that Batman and Superman live in. These guys, the Suicide Squad, they play on such a different field and they have to make a lot of those darker choices. It felt like I finally understood what the Suicide Squad really is and why it is they do what they do. I mean, that opening scene? It's definitely an introduction to some very fascinating characters who [laughs] they're not around very long. The one-liners that were included—I thought they were hilarious, and they really didn't pull any punches. They really went for it. But that's what's so great about the Suicide Squad. Speaking of the characters, this movie really goes for some deep cuts into the more obscure corners of the DC Universe when it comes to the cameos. So, I've got to ask, where do you rate on the "geek" scale here? Was there anyone you were familiar with and surprised to see show up? To a certain degree, yeah! I knew some of the characters. I definitely spent some time growing up reading comic books, watching those Saturday morning cartoons, basically being pretty obsessed. When I was three years old, my mother made me a Superman cape, I've always been a geek in that respect, and I think I always wanted to, you know, deep down be a superhero. So, to actually get the opportunity to do that in this format was a lot of fun. When you're dealing with a crew like the Suicide Squad, the morality gets a little shaky, right? 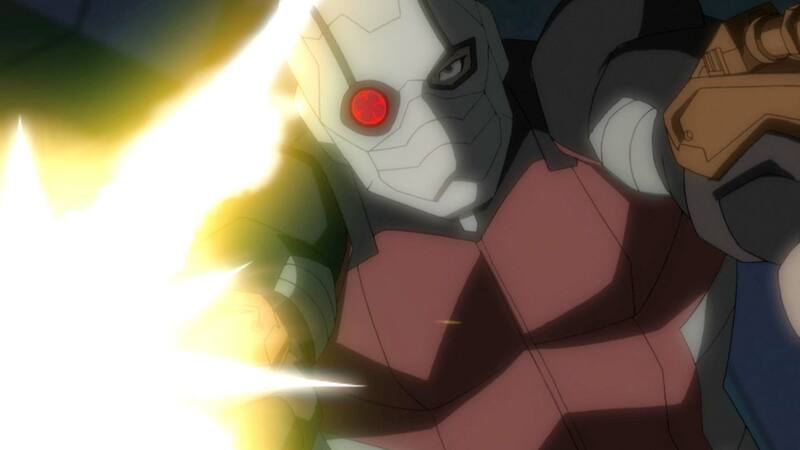 Do you think Deadshot is really a guy who can be redeemed? Is he a superhero? Or is he a stone-cold villain to you? Hmm… I would certainly say that he's made some questionable choices. He's got himself in a very difficult situation. He's trying to shift his way out of the hole he dug himself into, but at the end of the day, his main mission, against all the other missions he goes on, is to get back to his daughter and to actually be there as a father. I think that's one of the elements that really sets him apart. At his core, his heart is in the right place. He wants to be a hero, but he's so frequently misunderstood. He's frustrated by some of the choices that many of the actual quote-unquote heroes make—that's got him in a really difficult place. But I think in his heart and in his soul? He's a good character. At the core, you can really end up rooting for somebody like him. Suicide Squad: Hell to Pay is now available on Ultra HD Blu-ray Combo Pack, Blu-ray Combo Pack, DVD and Digital HD.